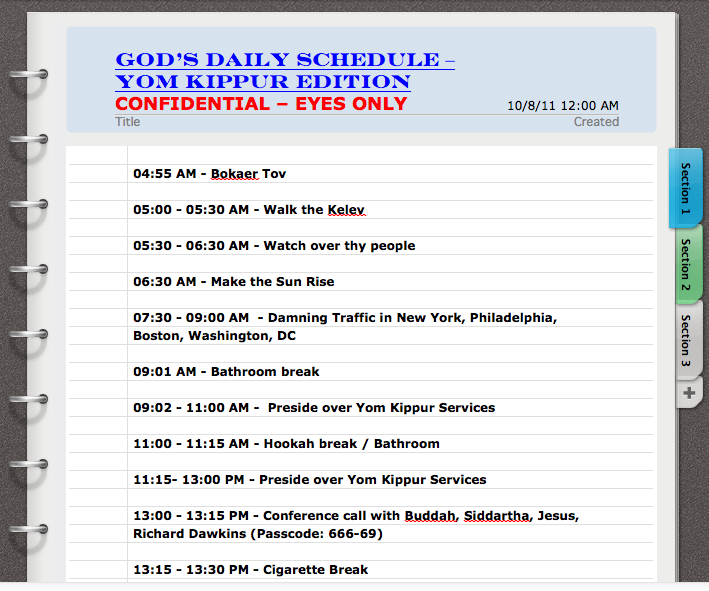 JERUSALEM, ISRAEL - (@TheComedyNews) - An unnamed Israeli news source is reporting that a leaked internal schedule for the Lord our God, Adonai has been found and made public. 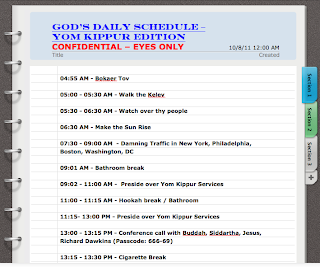 "God's daily schedule was found this morning in a discarded manilla folder on Ben Yehuda Street," revealed the unnamed source. "It appears that Adonai's day includes several five to 20-minute breaks when He is not watching over the conduct humanity at all." Some members of the Jewish faith look forward to exploiting some of God's intermittent downtime during the Holiday of Yom Kippur--- the most sacred day of year in Judaism. On this day, Jews around the world refrain from eating from sundown to sundown to atone for their sins in the previous year. "I'm totally going out to McDonalds to get a kosher Big Mac at about 1:20 PM today," rejoiced Sherri Adelsberg, a Chicago-native that recently made aliyah to Israel. At around the time Adelsberg sneaks her food when she should be fasting, God is scheduled to take a cigarette break from 1:15 PM until 1:30 PM. 20:00 - 20:45 PM - Take the Almighty Train back home.